These days, businesses everywhere are trying to integrate their management systems. They want to mesh their internal and external departments. This is a huge undertaking and takes lots of time. 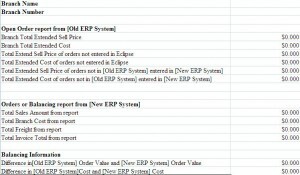 One of the tools that would come in handy in this situation is a free ERP implementation template from Excel. This is the sort of template that would be able to help guide a business through the process. Trying to integrate different departments into one has always been a huge hassle for everybody involved in the process. This is the kind of tool that can help out in this situation.